For as many years as I’ve been shooting with zooms I’ve owned and used lenses pretty much exclusively with f2.8 maximum apertures. I have tried to count the number of f2.8 zooms that I’ve had in my career and it is at least thirteen and probably one or two more that have been forgotten. It isn’t just me either – 90% of press and editorial photographers shoot on a daily basis with a 24-70 and 70-200 combination and probably have a 16-35 or something similar in the bag as well. It made a lot of sense when you were battling against low light and film or chips that couldn’t function beyond a relatively modest high ISO. The downside was always the weight – 70-200 f2.8 lenses are big, bulky and very heavy and so I have been toying with the idea of replacing my f2.8 zooms with new f4 versions for quite a while. Owning fast primes for those jobs where super fast lenses are needed has made the jump a bit easier whilst the quality of brand news lenses always gives your work a boost so I started the swap over three months ago with a Canon 24-70 f4L IS. It isn’t much smaller or lighter than the current Canon 24-70 f2.8L II but it has image stabilisation and a truly remarkable close focus (they call it macro) capability. The photo of the 70-200 at the top of this blog was taken with it without any form of accessory and I could have gone even closer had I wanted. I always tended to stop down to f4 or even f5.6 with most of my work using wider lenses and so this piece of kit makes a lot of sense and I have loved using it. Jump forward a couple of months, throw in a great cashback offer from Canon UK and I bought the 70-200 f4L IS. 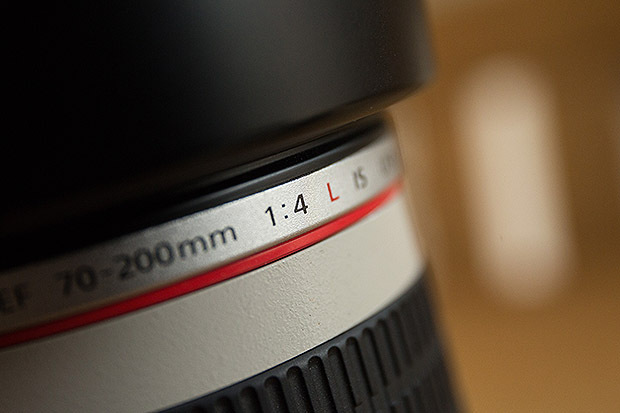 This lens is half the weight of the f2.8 version and is brilliantly easy to work with. The image stabilisation appears to be very good and for much of the work that I do it is a perfect piece of kit when married to a Canon EOS5D MkIII. Next up will be the 16-35 f4L – a lens that I have borrowed and used and been delighted with. My old 16-35 f2.8L is still performing well and it isn’t a range that I use all that often and so I can wait for Canon UK to run another promotion. Shooting at f4 isn’t a Weegee style philosophy but then neither was shooting at f2.8. I think that it is more of a practical reality where I have made a reasoned choice between speed and weight. Shooting wide open at f4 still gives some very shallow depths of field on the longer lens and owning fast primes is great cover for those extremely rare jobs where short bands of focus are needed. It makes great business sense to buy quality lenses that are almost 50% cheaper than the alternatives too – these days we all have to think about profit margins and the spiralling cost of doing business as a photographer is something that we all need to think about. I haven’t disposed of any of my f2.8Ls yet but I haven’t touched any of them since their cousins came to town either. I have the 70-200mm f4 IS lens and it is brilliant, a fantastic all rounder sharp at f4 and at every focal length. Did i mention how light it is ?